Thanks for sharing your code and efforts. I found that the code will discover my zone bridge along with the players. Then I get an error "Method Not Allowed" when attempting to call the method to determine if the zone bridge is a master. If I skip the zone bridge in the loops, the discovery process works. So I will try adding code to skip the Zone Bridge. Question: Do you know if would be possible to add a URI to queue that is a HTTP URL to an mp3 to stream from the web? I would love to have a queue built from my ex.fm or tumblr accounts. Question: Adding a URI to a queue? I would guess that it would not work if the source isn't a service that Sonos supports. However, you can try. Again, I would use Device Spy and try to do it manually first - insert URL - and see. I like the idea of it! Yes, the ZoneBridge apparently does not accept the GetPositionInfo method. So I will update the code to ignore ZoneBridges. ZoneBridge is the device that you can hardwire to the router so that we don't need to have any ZP or S5 wired. I think your hunch is probably correct about Sonos not allowing to stream from just any MP3 URI (other than supported services such as Rhapsody). More on the idea - I would like to be able to have a Bookmarklet and right click an mp3 link in browser or iphone to run a "Listen Later" command. It would add the URI to Sonos Queue to "listen later" - similar to "read later" for Instapaper. Or I would like to be able to stream from my ex.fm queue. In regard to the Bookmarklet idea. I like it. I hear a lot of music when I'm not at home with the Sonos system, but when I am with Sonos I want to listen in more detail and to have those references handy would be nice. So for the Bookmarklet idea, when you flag music, you basically save off artist, title, or whatever metadata is available and save it into a simple list say as separate XML files locally or in the cloud like in some service like Dropbox. Then when you are within range of your Sonos system, you can "walk down the list", formulate the request and send the request to the service of your choice. You will have to deal with non-exact matches and such. Not optimal, but it's a start. Haven't thought through it too much. If you've happy to run VLC you can play a list of URIs on Sonos. The app I'm developing reads a playlist of URIs and plays them on Sonos via VLC. If you're interested search for Sonospy on GitHub. Thanks for writing this program. I have one problem though. In my larger playlists the number of items is not correct. I have for instance a playlist with 2040 items but in the program it shows 348 items for that playlist. Also another one with 291 items shows 288 items in the program. I have also exported and imported them and then only the number of items mentioned in the program is shown in the Sonos. My playlists with up to 69 items seem to be ok. I don't know if it is a coincidence that the larger ones are not complete. I am not a programmer so unfortunately I am not able to check the code for indications. What I did notice is that the exported files are never larger than 320 KB. So after exporting all my playlists, the larger ones are all the same size (320 KB) but the original lists contain different number of items. Looks like I hardwired 1,000 items to return for a playlist in the GetPlaylist method above. So that's a limit and bad on my part. Should have made that a variable. That doesn't explain why playlists with less than 1,000 items are still not correctly importing. I'm wondering if it is this: the UPnP commands used to return playlist information only return so many items at a time, in chunks so to speak, and the program above only asks for data one time whereas it needs to keep asking until all the data is retrieved. I will have to try it myself by creating a large playlist and trying an export. Meanwhile, a question for you. When you import an exported playlist (that has been truncated), what items are imported, the first few hundred in order or is it random items from the original playlist? Thanks for your quick answer. As it seems the truncated playlists are truncated in order, so the first few hundred items from the original are transfered. The problem was as I guessed. You can't ask for all results at once - or, rather you can't for large amounts of data. I don't know what the cut off is, but somewhere greater than 400 items in playlist I started to see problems. So I created a variable that can be set to the number to bring back in each request. The program then just keeps calling until all are fetched. That is great news. Thanks for all your hard work. As soon as the new code is available I will test it. Updated the code. What changed: UPnP.cs and MainWindow.xaml.cs. Thanks very much TravelMax. I have tested it and as far as I can see it works perfectly. I also checked a playlist exactly on the spot where it was cut off previously and it just continues as it should. There is another thing I am also trying to do and that is to convert the Sonos playlists to m3u files. I tried your "What Sonos Is playing" program but the output is just text. On the page regarding this project I also saw the program from Finn Ellebaek Nielsen for extracting the current playlist as m3u file. I copied the code and saved it as HTM / HTML file. But this did not work. Obviously I don't have a clue what I am doing, so maybe you can give me some directions how to use it... If this takes too much of you time I do understand. My goal with the m3u list is to create a quick backup of my lists in the "Imported Playlists" on the Sonos (that nobody in the house can edit by accident from the Sonos). If I do succeed my next goal would be to find a program that would be able to copy the files from a playlist to a certain directory, so I can put them on an SD card and play them on the car radio. I have not looked at it yet but there are probably regular programs that can do that. I found a (freeware) program that can copy the audio files from various playlist types to a certain location (with or without the original folderstructure). Maybe other visitors might like to use it also. Be aware: I installed the "full version without setup" and after starting it, the program was in German. This can be changed by copying the correct "language.lng" file from the "language" folder to the start folder. re: converting playlist to m3u. Yes the "What Sonos is Playing" post only outputs the title. The current post "WPF Application" outputs a blob of XML that follows the DIDL schema. An addition to this program could be to output to m3u format. Or, you can consider a post transform, e.g. an XSL transform of the DIDL XML output into an m3u format. So, there is a couple of ways to tackle this particular aspect of the problem. The minor wrinkle in the larger plan is this: when you get information form Sonos you don't get the exact location to the music tracks. (Maybe I don't understand m3u playlist format - so take what I have to say with a grain of salt.) If you look inside the exported playlist file you will see references to the album and title. So if your music is at \\homeserver\music then you will have to build the exact path to each file using the album and title from the DIDL markup and use that built path in the m3u playlist. Then, where your music is homed for Sonos is where you would run the Amok program. At Travelmarx we keep our Sonos music share directory (e.g. \\homeserver\music) as the source and we typically don't want anything mucking around with it. Also we have various file formats (.mp3, .flac, .wma) we are dealing with so creating something for a SD card could be tricky because you might not be able to play the format in the car without some transcode. re: amok playlist copy program - i haven't tried it but sounds like it would work. So any method that would work is fine with me. So it should be possible to convert it to a regular playlist format (like m3u). Unfortuntely there does not seems to be an existing convertion tool current exported format. The fact that it only would export an m3u file from the current cue would not be a dealbreaker for me. But when it trancates the files it would be a problem. 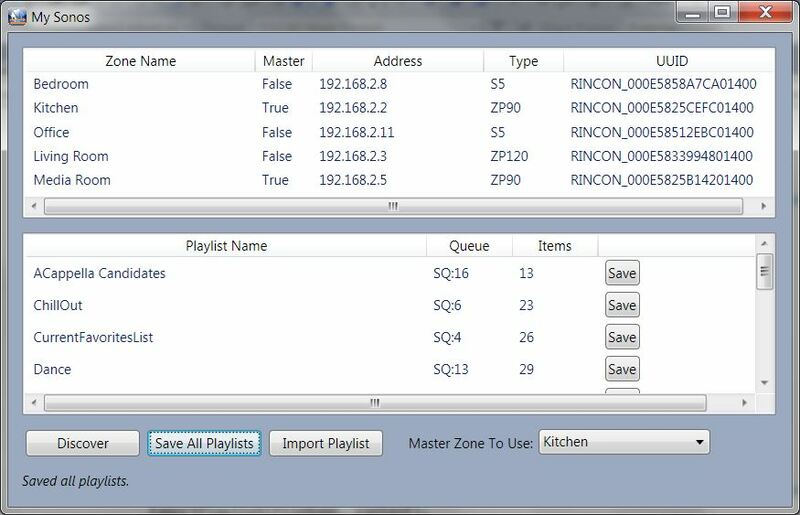 By the way your "What Sonos Is playing" program also truncates the playlists at exact the same place as the previous version of "WPF Application". I would only use the program to copy the files from the playlist, from the NAS to a local disk station. So I don't think I can do much harm. To be save I could also use a Read Only account on the NAS share during the copy action. I have a FLAC only library and they don't play on the car radio. But I use AudioConverter (which supports lots of fle formats) to do a batch conversion to mp3, on the files on the local drive. Yes, you are absolutely right, the path is there in the export. I overlooked the obvious. So that's good. The Nielsen program could be easily modified. But, I may write the m3u part of the WPF, I'll see :-). Sounds like you have your process with Amok all squared away so that's good. Thanks TravelMarx. I would be graful for either solution. And yes, the rest of the process is covered :-) Have a nice weekend. Did you find the solution (in code) how to skip the zonebridges in the discovery process? I would like to know since i have the same problem but cannot debug because that problem is on a remote server. I did suggest a solution above where the Discover_Click method in the MainWindow.xaml.cs file should have an additional logic check. Right after the start of the foreach loop where you look for the string "BR100" as part of the zone type and then don't complete the rest of the loop for that type, i.e. don't include the bridge in the collection that is displayed. I want to add this check and add support for m3u playlist generation, hopefully this weekend. Added support for creating m3u playlists. Addressed (hopefully) ZoneBridge issue. Made some other minor updates to sync with latest Sonos update. Note previous versions and release notes are here: http://cid-3faa5c9b69a80c67.office.live.com/self.aspx/Public/. I am wishing you and your family a very merry Christmas and the best wishes for the New Year. Thanks for the sentiment. If there are problems let me know. I don't do nearly enough testing due to time constraints. That goes for the m3u support and the support for dealing with (really ignoring) Zone Bridges. I was visiting friends who have zone bridges but kept eating and talking and didn't do much testing. Let me know how it works. Thanks. Zonebridge detection is working fine for me, as did the m3u export feature. Thanks! I don't have a zonebridge but m3u export works fine for me as well. I got a bridge and play 3 (Christmas) and I had to change the "zonebridge" check to just bridge as my bridge was reporting itself as "ZoneName:SONOS-BRIDGE". I posted in your first blog on this but thanks for all the details, was able to code up a little app that turns down the volume when I get a cell call (need to get a modem in to finish the landline part). Thanks. I just made an update. Probably better to be less restrictive. We don't have a ZoneBridge, but friends who have one invited us over for Christmas. I felt it was a bit awkward to spend the whole time on the computer! Thanks for testing. Again, cool work on the volume app. I ran across few problems lately. Is it in relation with the latest Sonos updates? At one of my customer 2 weeks ago, nothing was found with the "Discover" button when I was connected on his home network. "The underlying connection was closed: An unexpected error occured on a service. Try discovery again." I run Sonos 3.6 on my laptop. I just made an update to the program. V5 now (http://cid-3faa5c9b69a80c67.office.live.com/self.aspx/Public/SonosWpfApplicationV5.zip) and release notes (http://cid-3faa5c9b69a80c67.office.live.com/self.aspx/Public/releasenotes_SonosWpfApplication.txt). I've been wanted to revise discovery and that's what I did. I separated the collecting of the broadcast responses from the checking of them. Basically, I made two loops. Seems to perform better and require less overall time to discover. Also, tweaked MX header in discovery to 2 instead of 5. I tested on Sonos version 3.6.1 (build 16748310). Hope it works better. Also, just added this post: http://travelmarx.blogspot.com/2012/02/java-program-to-extract-whats-in-sonos.html which is a simple Java program to get what's in the queue and output to a file (simple list or .m3u). I will give it try. But allready my compliments! Thanks. This looks great. The link to the .zip file for version 5 doesn't seem to work anymore. Any chance you could fix it? Ran version 5 on my network in Visual Studio 2010. It looks like the Playbar (S9), Sub (Sub) and Play 1 (S1) devices thrown an exception UPnP.FindMasters method when the SOAPRequest is executed. These devices return a 500 error. This allows the app to continue processing and I could access the playlists. Interesting. I don't have those devices so I can't test. Would be interesting to probe these devices following the post "Exploring Sonos via UPnP" (http://blog.travelmarx.com/2010/06/exploring-sonos-via-upnp.html) and look to see that there is a /MediaRender/AVTransport/Control, etc. I changed the code at https://github.com/travelmarx/travelmarx-blog/tree/master/SonosWpfApplicationV5 and I'll update the version on Onedrive. Also, will add update note in the post. FYI, Checked with spy: When a PLAY:1 and SUB is connected to a Playbar the PLAY:1 and SUB don't have a /MediaRender/... service anymore in the list. I am unable to get the code to discover my Zones. I'm running Windows 8 + Visual Studio Express 2012 for Windows Desktop. My laptop is connected via wifi to my router with a default gateway address of 192.168.0.1. Do I need to change the _broadcastIP. I've tried changing it to various different values but no luck. Please can you assist? Fantastic posts on this subject. May I trouble you post an EXE if you wouldn't mind? I get an error on the 365 link. Visual Studio is a 9 GB download and wants to impregnate itself into explorer and context menu. Thanks very much. Sorry, I'm without a Sonos system to play with for a little bit. You can also access the code on Github at https://github.com/travelmarx/travelmarx-blog/tree/master/SonosWpfApplicationV5. In terms of Visual Studio, I understand downloading and dealing with it. The only thing I can suggest is to try Visual Studio Community version. I used it recently and it worked well. Will try to see about making an EXE. Like others here I had trouble getting Discovery to work, so I refactored the code using techniques from OpenSource DeviceSpy. Now works over all local interfaces and supports IPV6 too! I could get it from there. I haven't worked on the code in a while and would be good to try it out again with your fixes. 1. First, it looks like changes you did to discovery are much improved over what I had. Thanks! Also, other changes that I could see with a diff helped. 2. I noticed that in MainWindow.xaml.cs you commented out ExportPlaylist for save to .xml. Any reason why? 3. Along with Q2, you open a new DataWindow when saving to .xml, but there is nothing do with the data window after searching for dups. Is that just intended to be helpful information? Going forward, I think your version (after resolving Q2 and Q3) should be definitely replace what I have. Maybe we should just retire this post and point to what you have in Github?